From 1997-1999, Frank was the Planning Department's Graphic Designer. He composed numerous reports and master plans which integrated GIS mapping and a self-created archive of photos. Major city-wide information campaigns were developed and executed in various formats, most notably posters and brochures. 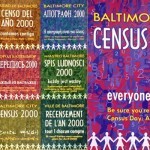 Numerous Baltimore City Department of Planning publications were prepared and released. These invaluable resources included a Development Guidebook, as well as yearly Capital Improvement Programs, and Community Association Directories. 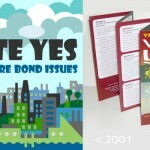 Bond campaigns consisted of brochures and posters published by the Baltimore City Department of Planning. I designed the public information consisting of brochures, posters and other collateral materials for three election campaigns. In addition to posters, pocket-sized brochures were also designed and produced in order to encourage citizen engagement in the 2000 Census. Versions included 12 different language translations.